The great-grandson of famous Mississippian William Clark Falkner and younger brother of Nobel Prize laureate William Faulkner, John Faulkner was born in Ripley on 24 September 1901. Faulkner married Lucille “Dolly” Ramey of Oxford in 1922. The couple had two sons, James Faulkner, born in 1923, and Murry “Chooky” Falkner, born in 1928. After earning a bachelor’s degree in civil engineering from the University of Mississippi in 1929, John Faulkner lived in the Mississippi Delta for several years, working as an engineer for the Mississippi Highway Department. In 1936–37 he served as part owner and chief pilot for Mid-South Airways in Memphis. In 1938 he moved his family to Greenfield Farm, a 320-acre property sixteen miles northeast of Oxford owned by his brother, William. In 1940 the family moved into town, taking up residence in Memory House, a large antebellum home that belonged to Dolly’s parents. John worked for the City of Oxford and occasionally taught writing classes at the university. During World War II he served as a US Navy pilot, achieving the rank of lieutenant commander, although he was too old for combat duty. In 1962 he achieved a degree of national notoriety by siding with the segregationists who opposed federal intervention in the integration of the University of Mississippi. Faulkner was also a writer and painter whose works depict characters, scenes, and events typifying his native region. His first published novel, Men Working (1941), which has been favorably compared to John Steinbeck’s The Grapes of Wrath (1939), dramatizes the trials of a sharecropper family victimized by the Great Depression and an inept government bureaucracy. His second novel, Dollar Cotton (1942), the plot of which may owe something to William Faulkner’s Absalom, Absalom! (1936), describes the rise and fall of a Mississippi Delta plantation owner during the early twentieth century. In addition to these works of social realism, Faulkner also produced a popular series of humorous paperback novels treating rural southerners in a style that combines the tall-tale humor of the southwestern yarn spinners and the pathos of Erskine Caldwell: Cabin Road (1951), Uncle Good’s Girls (1952), The Sin Shouter of Cabin Road (1955), Ain’t Gonna Rain No More (1959), and Uncle Good’s Weekend Party (1960). Faulkner also wrote two books of personal reminiscences, Chooky (1950), a semifictional composite based on the experiences he, his three brothers, and his two sons had during childhood, and My Brother Bill: An Affectionate Reminiscence (1963). Lesser known but just as significant as his writings are John Faulkner’s oil and watercolor paintings. A self-taught but talented artist, he sought to capture scenes of Oxford and Lafayette County that were fast disappearing under the onslaught of modernization that historian C. Vann Woodward has called the “Bulldozer Revolution.” One group of paintings, which Faulkner nostalgically titled The Vanishing South, includes such representative subjects as Carnival Time, Sorghum Mill at Night, Brush Arbor, Ginnin’ Time, and Possum Hunt. 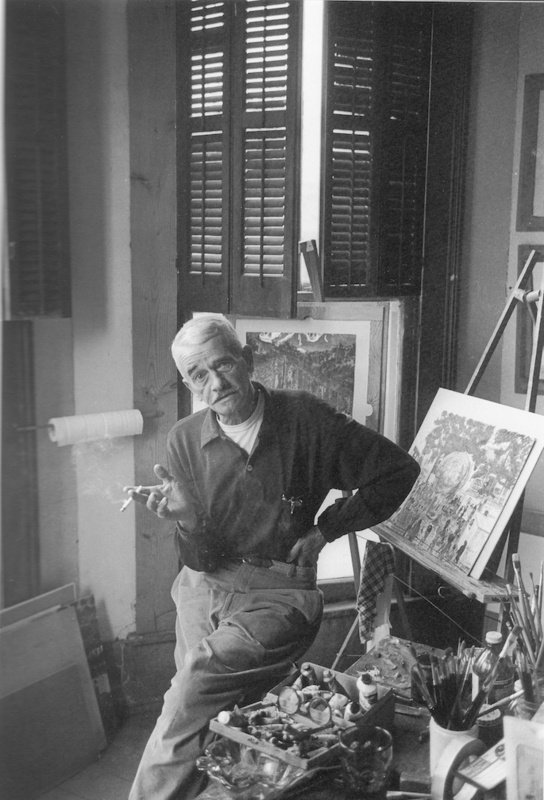 He also created two oil paintings based on stories by William Faulkner, The Bear and Red Leaves. John Faulkner explained the main theme of his creative work: “Before I forget all the places in Mississippi that I love I want to put them down in color and stories. I hope my paintings and writings are an accurate picture of the land that bred me and in which I have lived.” Faulkner died on 28 March 1963 in Oxford.